Vishal Gondal, a huge icon in the gaming industry, is a grounded, simple person at heart. Tired of globe-trotting and hotel rooms, he asked us to create a space that felt like a warm home. We worked with him to weave in his yearning for a welcoming home with his natural understated design ethos. 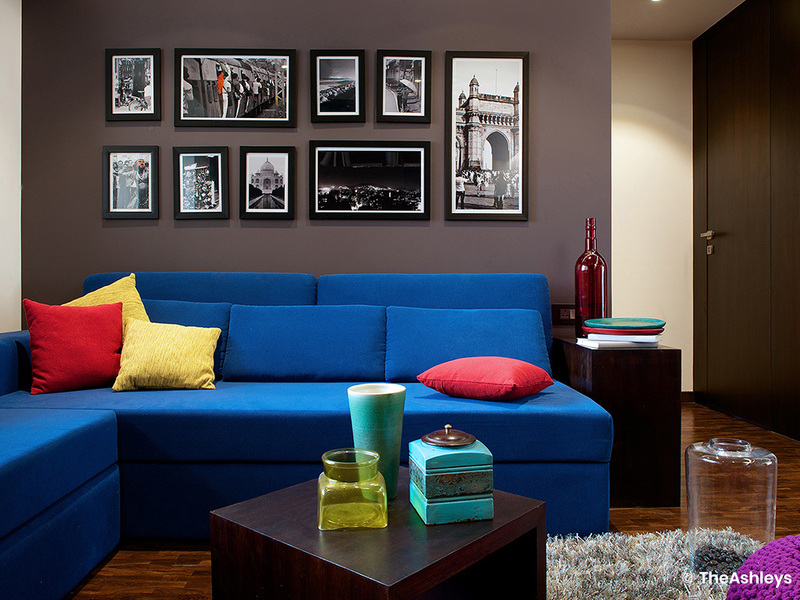 The space was originally two separate 3 BHK apartments on different levels. We integrated these into one large apartment, deliberately creating a division between the floors. The lower floor was designed for hosting guests and social events, while the upper floor was designed as a private space for just the family. For the upper zone, we created a parent’s room, a master bedroom, and a room for the two little ones. In the lower floor, we created a living room, dining area, kitchen, guest room, and a home entertainment room. The entry was designed to allow access to the upper floor without having to go through the lower zone, allowing members quick access to their space. In terms of design, we deliberately chose soothing tones with pops of colour to add warmth and interest. Handpicked accessories were used to add a sense of customization and to reflect the unique personalities of each member of the family. A contemporary vibe was created by using minimal, stylized art and décor. We chose materials like wood to bring warmth, setting them against a backdrop of a grey and white canvas to create a fluid look that flowed through each room. In the master bedroom, we created a luxurious sense of peace and privacy. A delicate blend of textures like linen and plush enhances the sensory enjoyment of the space. The den is separated by a glass wall, allowing the clients to revel in a large space, with fabric blinds for when they want to retire from the world. The bathroom is planed into three zones, heightening the indulgence of the Jacuzzi, the mirrored walls, and the separate shower cubicle. A library separates the den and study, with the décor undergoing a subtle shift from warm wood to contemporary red. A set of carefully balanced random niches adds interest to the space, while framed attention-grabbing artwork draws the eye to the neutral walls. The entertainment room or den is wrapped in a grey to complement the bold red wall against which we used a finely carved black Ferrari emblem. Deep seating that invites you to lounge, with an acoustically treated room for superior sound quality sets the stage for a family movie marathon.